A “Logic Bomb” is a computer program which sits idle within a larger computer program. When certain conditions are met, like x number of seconds pass, or days, or number of transactions, or a certain dollar amount is reached, whatever condition is contrived by the programmer, the Logic Bomb initiates. Typically, Logic Bombs are malicious. Programmers who think they are undervalued might insert Logic Bomb code into software and only they would know who to activate the code. When the programmer is fired, the programmer can set-off the Logic Bomb. The Logic Bomb then begins over-writing the software with new instructions which usually work to hinder or destroy the old code in favor of the new code. What if someone told you “Everything you know to be true is a misconception?” What if someone told you “The Theory of Gravity is a misconception?” Or, “The Theory of Evolution is a misconception?” How can a theory be a misconception? Aren’t theories immutable? If I understand Dr. Deutsch correctly, then, no, theories are not immutable. Our knowledge is incomplete, therefore our theories must be incomplete. The Theory of Gravity may, in fact, change at some point within our lifetime. We experience gravity, we apply formulae, and we can make very accurate calculations about the effects of gravity, enough to land a small car on a distance planet. Yet, we don’t at this point understand the nature of gravity. Once our knowledge of gravity has been expanded to fill in our knowledge gaps, our current Theory of Gravity may be replaced by a new gravity theory. Thus, our former “theory” was simply a misconception based on incomplete information. Deutsch argues throughout our current schemes for knowledge acquisition are “parochial.” My review copy has 459 pages and I am sure “parochial” appears at least 459 times. Parochial is defined as “narrow-minded” or as having a “narrow scope.” The use of the word throughout bears a special significance to Deutsch, I think, as his primary theme is we do not think in broad enough terms, and do not incorporate enough vision to really see the nature of a problem. Dr. Deutsch has no qualms referring to other scientists by name, and not just dead ones, like Richard Feynman. Richard Dawkins and Jared Diamond both fall under Deutsch’s scrutiny. For instance, Deutsch takes issue with Jared Diamond’s rationale the fate of cultures and nations is predicated upon their biogeography. Deutsch argues biogeography may have a role in the demise of a civilization, but the ultimate reason for a civilization to collapse has more to do with the nature of static societies versus dynamic societies (more on this later). Static societies, simply put, are unable to adapt, are rigid and fixed and unable to yield, be flexible, or change in accordance to changes in societal needs or environmental impact. Dynamic societies, on the other hand, are able to supplant out-dated or obsolete epistemological functions in favor of new knowledge which allows them to remain viable. No doubt Dr. Deutsch brings considerable thought to his topic. His background in quantum mechanics is without equal. In writing this review, I question my own ability to write an adequate review merely because my own inadequacies in problem identification have been called into question. And, challenging our notions of problem identification is what Deutsch’s explanations are about. Newton, Darwin, Turing, Einstein, Feynman, all geniuses but all wrong to some extent. Some were wrong only because technology or knowledge didn’t exist to assist them. Others were wrong because they stopped in their reasoning too soon, or were too “parochial” in their thinking. 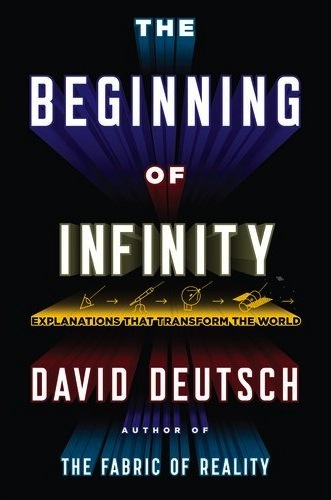 But, this is the challenge Dr. Deutsch bring to light in The Beginning of Infinity; are we really stripping away all the effects to reach the cause, or have we allowed ourselves to become smitten with our own hubris and settled on “effect as cause” leaving the real cause unidentified? No doubt Dr. Deutsch research within the Quantum World has provided him a unique experience and framework for stripping past the electron cloud, the proton-neutron core, tunneling down to the elemental forces which all matter is defined, and being so, allowing him to look back from his elementary perch up into the emergent particles, atoms, molecules, and matter, the products of the formative energies of the universe. From this perspective, almost as if one where out in the wilderness on a clear starry night, with the dim band of the Milky Way stretching overhead, Deutsch say, strip away everything you know about what you know; its probably wrong. Begin your thinking again, from this emergent point, reach out and challenge yourself and what you know. This is what separates us from other mammals – our creativity, our ability to think beyond ourselves. Our ability to evolve our “memes,” our cultural genes, to ensure our progress, our advancement. After all, ALL problems are soluble.